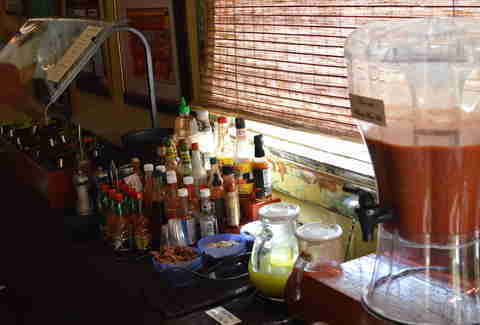 This French Quarter bar is best known for two drinks: Bloody Marys and frozen Irish coffee. 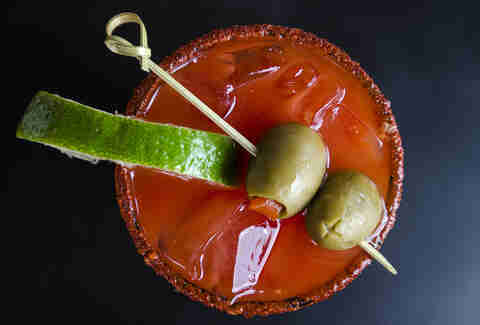 The Bloody Marys used to be made “a la minute” to order, according to the bartender, but the demand became so great that now they’re batched up every morning. The base mix is a local commercial mix, with precisely nine ingredients added, including the not-so-secret secret ingredient, Guinness. 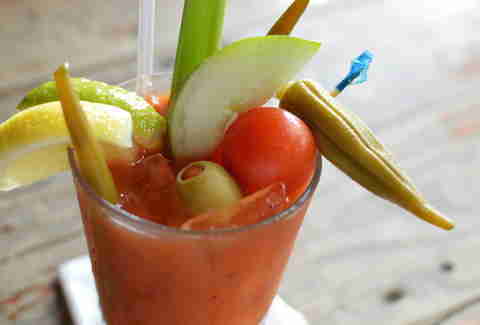 This temple to the build-your-own Bloody Mary concept began the trend and does it right, with pickled vegetables (including Brussels sprouts and asparagus), real bacon crumbles, and one’s choice of house Bloody mix, house-juiced yellow tomato juice (made with tomatillos, cucumber, jalapeño, lime juice, and other goodies), and red tomato juice. 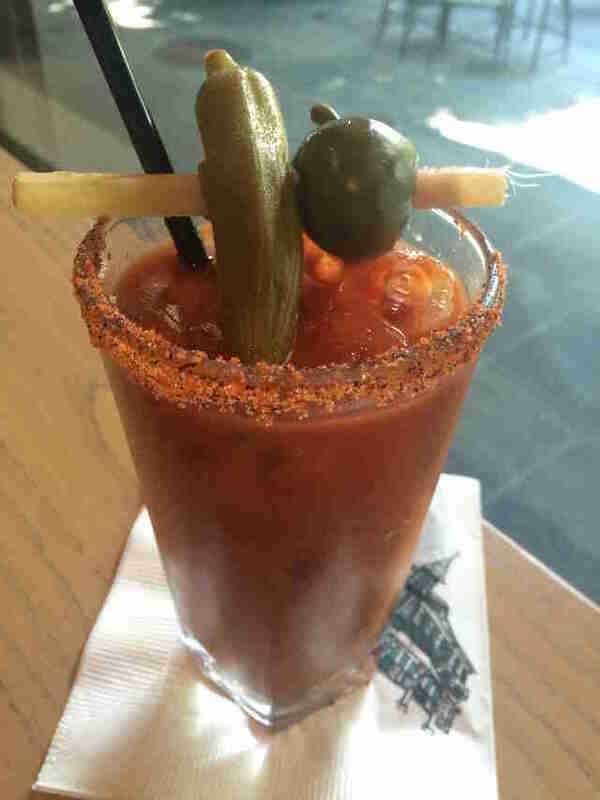 This upscale breakfast restaurant’s Bloody Marys have a real kick to them -- definitely one of the spiciest Bloodys in the city. Pro tip: order a Bloody Bull for the addition of some beef broth to the mix, which will provide much-needed protein and electrolytes. Then order something sinful and rich for breakfast and that’s how you do mornings in da Quarter. 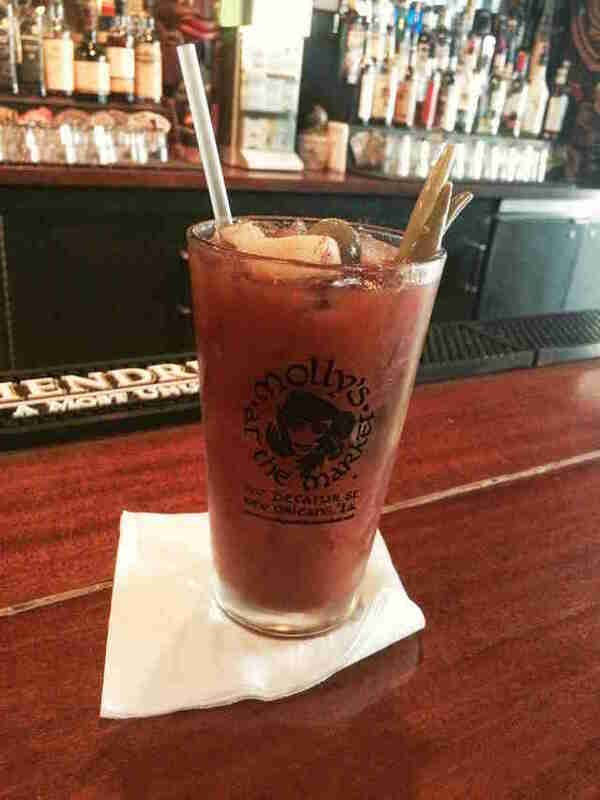 The Bloody Marys at Molly's (as well as at its sister restaurants 13 in the Marigny and Junction in the Bywater) have been well known and well loved for many years by visitors, locals, and service industry folk alike. It’s the perfect environment to hide away from daylight and relax while planning your next move -- be it food, a nap, or more Bloody Marys. This carefully guarded Bloody mix recipe is so secret that the bartender didn’t even know what was in it. 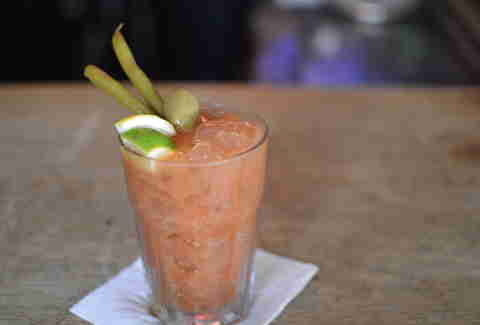 Spicy, balanced, and loaded with pickled veg and citrus, it’s perfect for dealing with a hangover in the dark, divey bar as well as for taking over to Surrey’s, the trendy brunch spot next door, which doesn’t have a liquor license. Fortuitous, yes? Home of the famous praline bacon, this incredibly popular breakfast and brunch joint (which also serves lunch and dinner) batches up its secret Bloody Mary mix at least three times a week. The gentleman in charge of making the mix attributes its success to the horseradish and celery salt. The house-pickled green beans provide a spicy, super-sour kick as well. At Commander’s, service is everything. 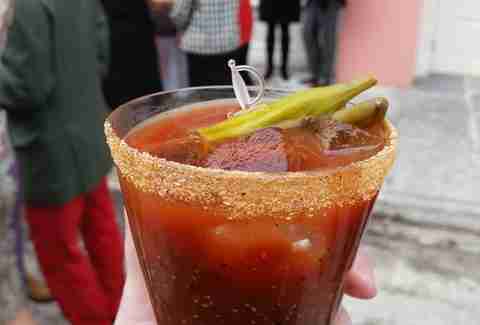 So it’s no surprise that the highly classified Bloody Mary mix arrives with a spiced glass rim and then is spiked tableside by your server with a bottle of vodka kept encased in a block of ice nearby. LPG’s specialty -- the Big Red Hammer -- is no joke, my friend. Here’s what you get for 16 bucks: house-made Bloody Mary mix, Tito’s Handmade Vodka, poached shrimp, blue crab claws, and house-pickled vegetables served in a Mason jar with a fork. Because, there’s breakfast. Hungover vegans and vegetarians of the world, rejoice, Green Goddess feels your pain. 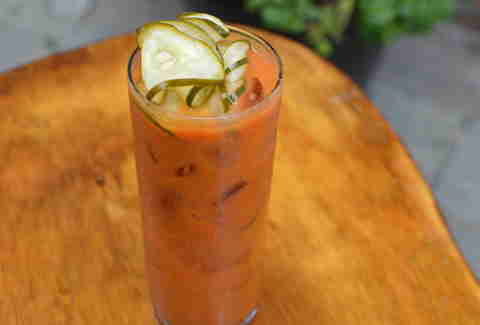 The urban garden oasis/cafe prepares a Naked Mary, made without Worcestershire sauce, but with house-roasted tomatoes, Jamaican Pickapeppa sauce, local Crystal hot sauce, Louisiana’s Cathead vodka, Bittermen’s Hellfire bitters, and lots of spice, plus house-made cucumber pickles to top it off. 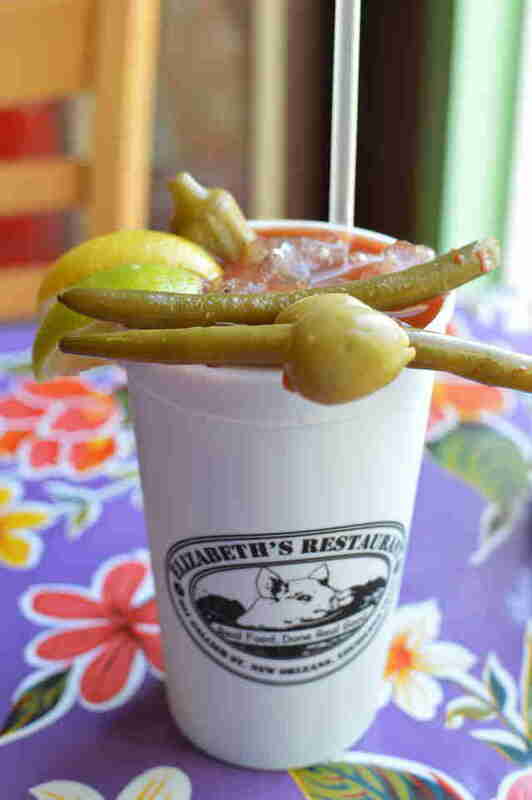 Order the deluxe Bloody Mary to kick the beverage game up a notch with your fancy uptown brunch; it comes with two shots of vodka, house-made Bloody Mary mix, boiled shrimp, spicy beans, cherry tomatoes, celery, lemon, and lime -- and should fix whatever ails you. This collaboration restaurant concept between chefs John Besh and Aarón Sánchez serves authentic Mexican food with a definite Louisiana flavor. 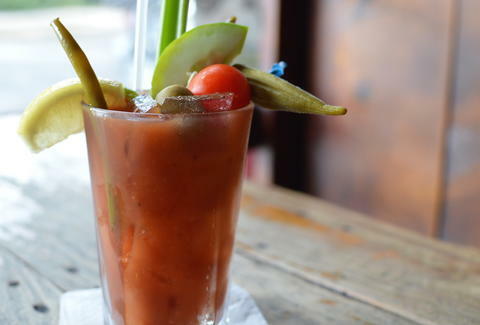 One could order a Bloody Mary while brunching here, but why, when this spot serves a michelada with Dos Equis, tequila (instead of vodka), and house-made sangrita (instead of standard Bloody Mary mix). Sangrita is a lighter, sweeter mixer made with tomato, orange, and lime juices blended with agave nectar. Mexican restaurant and tequila parlor Araña also serves a michelada, this one made entirely with beer and enhanced with house-made Bloody mix and a spicy salt rim. Araña’s michelada also pairs perfectly with tacos or tortas. Nora McGunnigle is a New Orleans writer who normally creates her hangovers with beer, but in this case, is willing to make an exception. Follow her at @NoraDeirdre.